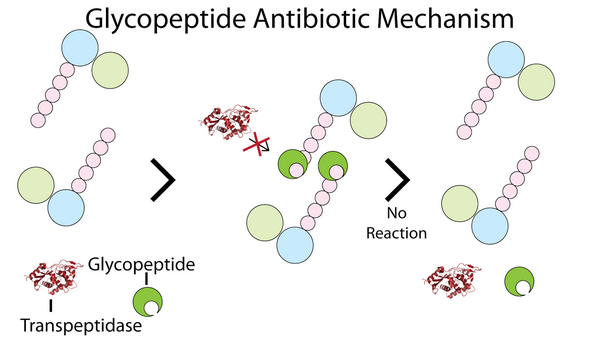 Glycopeptides are bactericidal antibiotics used principally for treatment of severe gram-positive infections in patients who cannot receive or who have failed to respond to penicillins and cephalosporins. They may also be used in patients suspected of having pathogens resistant to β-lactams and other anti-infectives. Glycopeptides are believed to be the only antibiotics with universal activity (i.e., no resistance has been reported) against S. pneumoniae, and physicians reserve them for severe community-acquired pneumonia episodes in which multidrug-resistant organisms are suspected or the patient has life-threatening complications such as bacteremia or meningitis. Glycopeptide therapy is relatively well tolerated. The most severe adverse reactions are ototoxicity (dizziness, vertigo, and/or hearing loss) and nephrotoxicity (decreased renal function), but they occur infrequently. Hypersensitivity, of which skin rash is the most common allergic reaction, is reported in 5-10% of patients. Other possible side effects of glycopeptides include gastrointestinal disturbances, muscle pain, blood disorders (e.g., eosinophilia), and disturbances in liver enzymes. While glycopeptides demonstrate no activity against gram-negative organisms, no cross-resistance between vancomycin and other antibiotics has been reported in gram-positive microbes. Glycopeptides inhibit bacterial cell-wall biosynthesis by blocking glycopeptide polymerization. This effect produces immediate inhibition of cell-wall synthesis and secondary damage to the cytoplasmic membrane. Glycopeptides also alter the permeability of the cytoplasmic membrane and directly inhibit RNA synthesis; however, the impact these effects have on bacterial viability is largely unknown. These agents have a concentration-independent bactericidal action resulting primarily from inhibition of cell-wall synthesis; they are considered slowly bactericidal against staphylococci. Vancomycin (Lilly's Vancocin, generics) is a narrow-spectrum, bactericidal glycopeptide antibiotic. Vancomycin was developed in the 1950s and has been available worldwide since the 1960s; it is available in oral and IV formulations. The oral formulation is not systemically absorbed and is used for the treatment of gastrointestinal infections such as staphylococcal enterocolitis and antibiotic-associated pseudomembranous colitis caused by Clostridium difficile. Use of the injectable glycopeptides is limited in community-acquired pneumonia, primarily to treat severe gram-positive infections, including multidrug-resistant staphylococci, S. pneumoniae, S. aureus, and S. pyogenes. Vancomycin has a relatively long duration of action and therefore can be given every 12 hours. Vancomycin has been available for a long time, and no high-quality clinical studies pertaining to community-acquired pneumonia have been conducted in recent years. Therefore, this section does not cite specific efficacy or safety results from clinical studies. 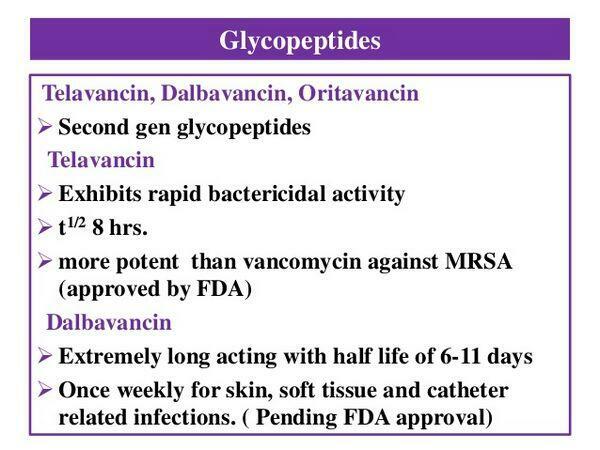 Vancomycin is contraindicated in patients with a history of hypersensitivity to this antibiotic or other glycopeptides. Ototoxicity has occurred in patients receiving vancomycin and can be either transient or permanent. Most cases have been reported in patients receiving high IV doses or in patients with a history of hearing complications. Vancomycin is also associated with nephrotoxic effects, and patients should be screened for a history of renal complications. Renal failure has been reported in patients receiving high doses of IV vancomycin. Vancomycin is also associated with infusion-related flushing, known as "red man's syndrome." Resistance to vancomycin can be achieved by a modification of the components of the bacterial cell wall. Vancomycin binds to a component of the cell wall that when modified or altered results in reduced binding of the drug to the bacteria. Teicoplanin (Sanofi-Aventis' Targocid) is a narrow-spectrum, bactericidal glycopeptide antibiotic similar in structure to vancomycin. It was first launched in France and Italy in 1988 and by 1997 was available in most of Europe. It was launched in Japan in 1997, where Aventis has partnered with Fujisawa for distribution and copromotion, but has never been available in the United States, where development was suspended in 1999. This agent is expected to lose patent protection in Japan and European markets between 2004 and 2008. Teicoplanin is available in parenteral formulations and has a significantly longer duration of action than vancomycin, thereby allowing once-daily administration. 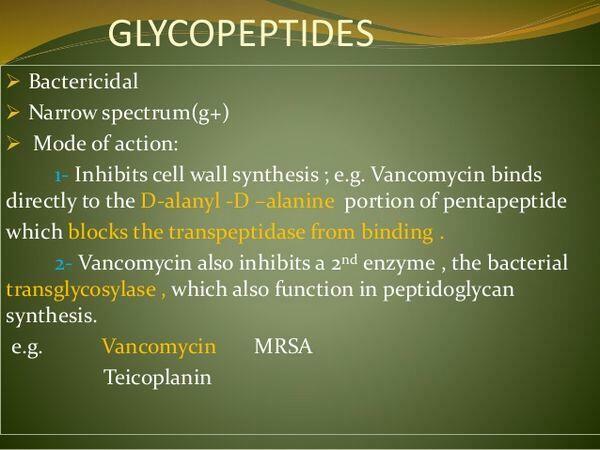 Unlike vancomycin, teicoplanin can be given by IM injection as well as IV injection. Considered a valuable alternative to vancomycin, teicoplanin has a spectrum of activity that includes both aerobic and anaerobic gram-positive bacteria, including methicillin-resistant S. aureus (MRSA). For community-acquired pneumonia, use of the agent is generally limited to complicated cases in which Staphylococcus is suspected and to patients who cannot receive or have failed to respond to the penicillins or cephalosporins. A multicenter study compared the efficacy of teicoplanin and ciprofloxacin with that of ceftriaxone in the treatment of community-acquired pneumonia in elderly patients and in patients with coexisting diseases (such as chronic obstructive pulmonary disease and diabetes mellitus). Patients received either IV teicoplanin (400 mg/day) plus oral ciprofloxacin (1 g/day) or IV ceftriaxone (2 g/day) in a randomized, single-blind manner. Cure or improvement was observed in 39 (97.5%) of 40 combination therapy recipients and 36 (83.7%) of 43 ceftriaxone recipients. Teicoplanin has less propensity than vancomycin to cause nephrotoxicity, oto-toxicity, or infusion-related flushing (red man's syndrome). However, it does share some of the same adverse reactions, including ototoxicity and nephrotoxicity. Hypersensitivity reactions should also be a concern of physicians considering teicoplanin therapy.